A lot of commentators are complaining that Apple’s update of the 12-Inch MacBook last week is a bit of a damp squib. I don’t know what they were expecting, since it would be very unlike Apple to do a major makeover of a Mac model just one year into its production life. The modest speed bump and other performance and feature enhancements the skinny MacBook got were very much consistent with Apple past practice, and especially predictable with the other MacBook model families being arguably due or overdue for some major attention. Based on that hint, my guess is that we will see new thinner, lighter MacBook Pros later this year with Intel sixth generation Core “Skylake” CPUs and USB-C ports — hopefully more than just one per unit, Intel HD Graphics 515 integrated graphics processors, 1,866 MHz memory access — up from 1600 MHz — and faster PCIe access to stored data. What we are unlikely to see is touchscreen displays so no detachable hybrid MacBook Pros either. Several months ago, Apple did patent a device design that appears to be a detachable laptop, but even if such a product is in Apple’s future, it won’t necessarily be a Mac. My guess is that if Apple ever does build a touchscreen detachable hybrid, it will probably run the iOS and not the Mac OS. If I stick to my usual three year system upgrade calendar, I’ll be looking for a new anchor Mac this fall, although the mid-2013 MacBook Air is still doing a fine job. 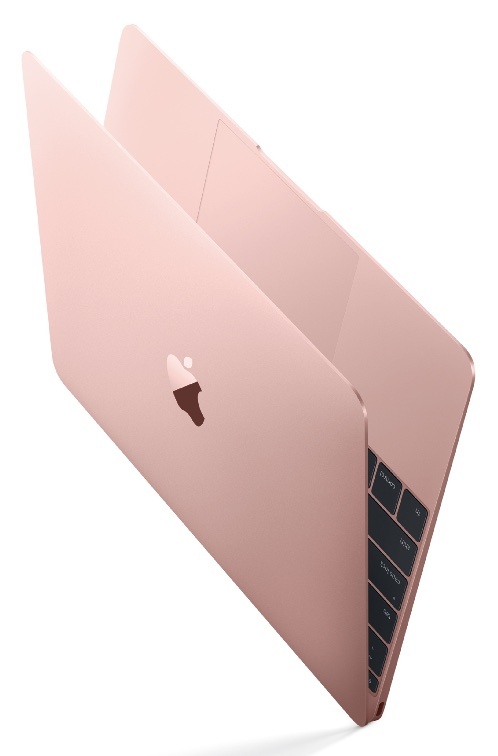 I’m intrigued by the little MacBook, and the Rose Gold option especially appeals. However, I’m not sure I could live with the MacBook’s high-effort, short travel keyboard that is 34 percent thinner overall with stainless steel dome switches and an Apple-designed butterfly mechanism that is 40 percent thinner than the company’s traditional keyboard scissor keyswitches. Indeed, I’m more than a bit apprehensive that if the 12-inch MacBook design is the bellwether for the future of Apple laptops, said future will include sliver-thin MacBook Pros with the MacBook keyboard. In my decades-long battle with peripheral neuritis and repetitive stress from typing, I’ve learned that I have to be very careful choosing keyboards, and “clicky” types with stiff (Apple says “crisp”) action generally don’t wear well with me for long typing sessions. I’m getting along reasonably well with the keyboard in my MacBook Air, but definitely find my Logitech Wireless Solar Keyboard K-750 external ‘board much less stressful on my hands and arms for desktop typing. Apple adopting the thin MacBook keyboard in redesigned other laptop models would push me toward using my iPad and its virtual keyboard more for mobile duty. Apple was also recently granted a patent for a “configurable, force-sensitive input structure for an electronic device,” which in plainer English is a capacitive keyboard that could be used in laptop computers instead of the traditional physical keyswitch type keyboard. Essentially, it would bring tablet-style virtual keyboard input to laptops, with the addition of haptic “motion” feedback even though the user would be striking zero-travel “keys” on a flat plane. Advantages of such a setup would include enabling iOS style custom keyboard layouts that could change for optimization with the application in use, a drastic reduction in moving parts and elimination of the mechanical wear factor and increased resistance to dirt and/or moisture ingress. ock. Other benefits would be presumed lower-cost, and with Apple’s thin device obsession — potential for even slimmer laptops than the 12-inch MacBook. I’m a big fan of using the virtual keyboard in my iPad, although on a 9.7-inch panel in landscape mode you do lose half or more of the screen’s depth to accomodate the keyboard. That would not be an issue with a capacitive ‘zero-travel’ keyboard located on the lower plane of a clamshell laptop form factor. Consequently, this is a concept that I think I could happily embrace, and I hope Apple will proceed with it. I haven’t said much yet about the MacBook Air because there is probably little to say in terms of the Air’s future. I love my 13-inch MacBook Air, and would be delighted if Apple continued upgrading it with Skylake silicon, the faster RAM, graphics and PCIe memory access, a Retina panel, and a USB-C port or two. However I think it unlikely that Apple would lavish that sort if attention on what is now a six-year-old form factor. Indeed the 13-inch MacBook Air already got what could very well be its swan song upgrade last week with Apple quietly bumping it’s standard RAM config. to 8 GB, and probably that’s all folks. Whether the MacBook Air will actually disappear in the near future is another matter. With their non-Retina displays, the two MacBook Air models do give Apple lower-priced (in an Apple context) entry level laptops starting below the psychologically significant $1,000 threshold, and note that they are even still selling the old nine-Retina, mechanical hard disk drive, built-in optical drive 13-inch MacBook Pro as a sort of behind-the-counter selection at the Apple online store. That means Apple is currently selling three distinct 13-inch Mac laptop form factors with three different screen resolutions, plus two 12-inch portable computers if you include the 12.9-inch iPad Pro, plus the 11.6-inch MacBook Air — a crowded state of affairs that probably could use some rationalization. If it weren’t for that sticky matter of entry level price, a logical assumption would be that the MacBook Air is a goner, but disappointingly, Apple didn’t budge on the 12-inch MacBook’s $1,299 starting price with last week’s upgrade, and it would be hard to sell a machine with a Retina display for under $1,000 and still maintain the sort of profit margins Apple demands. It will be interesting to see how they address these issues, with the picture possibly becoming clearer at the WWDC in June.